Given a collection of boolean spatial features, the co-location pattern discovery process finds the subsets of features frequently located together. For example, the analysis of an ecology dataset may reveal the frequent co-location of a fire ignition source feature with a needle vegetation type feature and a drought feature. The spatial co-location rule problem is different from the association rule problem. 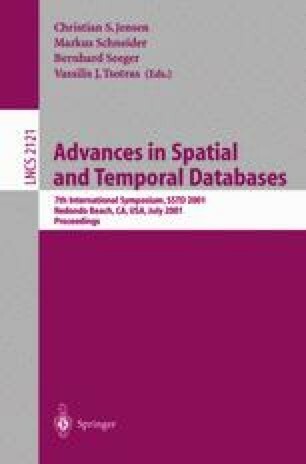 Even though boolean spatial feature types (also called spatial events) may correspond to items in association rules over market-basket datasets, there is no natural notion of transactions. This creates difficulty in using traditional measures (e.g. support, confidence) and applying association rule mining algorithms which use support based pruning. We propose a notion of user-specified neighborhoods in place of transactions to specify groups of items. New interest measures for spatial co-location patterns are proposed which are robust in the face of potentially infinite overlapping neighborhoods. We also propose an algorithm to mine frequent spatial co-location patterns and analyze its correctness, and completeness. We plan to carry out experimental evaluations and performance tuning in the near future. Supported in part by the Army High Performance Computing Research Center under the auspices of the Department of the Army, Army Research Laboratory Cooperative agreement number DAAH04-95-2-0003/contract number DAAH04-95-C-0008.